Ottawa’s streetcars are gone now — the last one ran in 1959 — but when the lines started pushing out along the compass points from the hub of downtown in the 1890s, they made the suburbs possible. The line that ran westwards travelled alongside what is now Byron Avenue (drive down Byron, and it is easy to see where it once was) until it met Richmond Road, Ottawa’s oldest thoroughfare, where the cars reversed direction, and another line carried on toward the dance hall and riverside amusements out at Britannia. The gentlemen playing bowls at Highland Park club learned to ignore the rattling transportation. That part of town gained the name Westboro, and soon the car arrived — the first one in Ottawa in the 1890s was actually electric — and an industry grew up around it. And Bourk’s Ignition was right there at the Byron-Richmond junction. 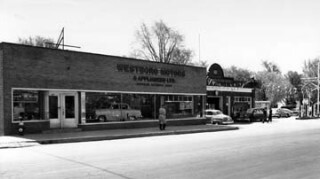 Alongside was Westboro Motors, and directly beside that was the Westboro Garage with forecourt gas pumps. Gradually the Bourk family was able to acquire these other automotive interests all the way to the corner of Golden Avenue. Now Bill Bourk, working with architect Barry Hobin (who grew up in Westboro), has moved the family business from cars to condominiums. On the former car-servicing site bounded by Roosevelt Avenue to the east, they have raised up the historically referenced Westboro Station twin set of condominiums. Just over 100 condos reside in the terraced eight-storey buildings. (Eight storeys is two higher than the local resident-evolved guidelines.) There is a hint of Inca architecture in the design, albeit one with a courtyard and a bland, ground-level storefront, which includes a coffee shop. The streetcar doesn’t stop here anymore, but the Wellington-Richmond residential-retail corridor runs on.